Bayern Munich may have lost the first battle, but they have most certainly not lost the war. The Bundesliga champions will head to Madrid with a 2-1 deficit to overturn in the second leg of their UEFA Champions League semi-final against Real. And all the factors available to make what would be an historic night come to fruition. On loan at Bayern from Real Madrid, James provides the most fascinating sub-plot to this tie, amid a welter of backstories. The Colombian's reportedly fraught relationship with Madrid coach Zinedine Zidane will no doubt come under the pre-match Marca microscope, and while the sense is that the Frenchman was happy for James to leave, his fellow players seemed less enamoured with the decision. As recently as November, Cristiano Ronaldo pointed to the playmaker's departure as one reason for Madrid's up-and-down form this term. Watch: Sit back and enjoy all of James' goals and assists in a Bayern shirt so far this term! You can understand why: James, whose goals and assists have been key to Bayern's sixth successive domestic title, has settled seamlessly into life in Bavaria and – playing in a deeper midfield role – is perhaps a more complete footballer than ever. Indeed, having spoken openly about his desire to win the treble this season, that Madrid represent the next obstacle on Bayern's three-pronged path to glory is one of the more amusing jokes fate has played. 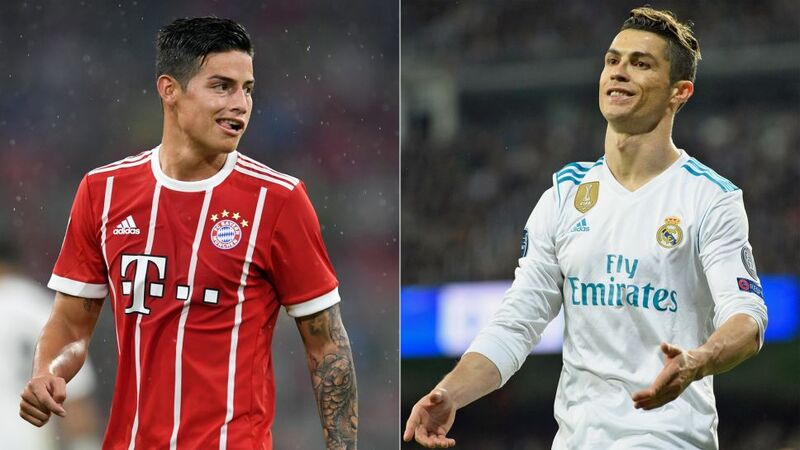 James will be champing at the bit to show Zidane and the Madrid fans quite why it was a mistake to let him depart – and if anything is missing from his Bayern CV to date, it's a statement performance in Europe. Don't bet against that coming in the second leg at the Santiago Bernabeu. Few Germans, Toni Kroos and Paul Breitner perhaps aside, know the inner workings of Real Madrid better than Heynckes, who led Los Blancos to European glory in 1997/98, and is to date the only German coach in the Spanish club's storied history. Accordingly, few Germans know quite as well how to best Madrid in Europe – as Heynckes has already done once in 2012 when he led Bayern past Los Merengues on penalties in the semi-finals (having played the first leg at home). For all their recent success – and there has been plenty – Real traditionally struggle against German opposition, most notably Bayern, who are known in the Spanish capital as La Bestia Negra - the black beast. As Sid Lowe put it in the Guardian in 2012, "this may well be the only genuine, cross-border rivalry in Europe". Like most rivalries, the superpowers have more in common than they care to admit: both are dominant domestically, both hoover up the best young talent and both aspire to represent something bigger than themselves. If any one club can claim to have Madrid's number, however, then it's Bayern: of the six semi-finals between the sides (the teams have never met outside the European Cup, their 25 encounters in the competition the most of any pair), the Bavarians have come out on top in four. While the rivalry has cooled off the field in recent years – the absence of Oliver Kahn, who made a hobby of spitting barbs in Madrid's direction, has helped to that end – it has intensified on it. The 12-time winners have triumphed in the sides' two most recent two-legged ties, producing a ferocious display of counter-attacking football to win 4-0 at the Allianz Arena in the 2014 semi-finals, before a victory in extra-time in last season's quarter-finals. Mere mention of that quarter-final is usually enough to rile Bayern fans – it's safe to say the club felt hard done by after last season's elimination at the hands of Madrid. It certainly still rankles with Joshua Kimmich, who spoke before the draw of "wanting revenge"; Arturo Vidal echoed his sentiments, tweeting afterwards that "revenge is a dish best served cold". Time for a quick recap as to why it was such a painful exit for Bayern: shorn of Robert Lewandowski in the first leg, Carlo Ancelotti's side went ahead on home turf when Vidal nodded past Keylor Navas. When Bayern were awarded a penalty on the stroke of half-time, the Chilean stepped up but fired over. It proved the turning point: Ronaldo equalised after half-time, Javi Martinez was dismissed and the Portuguese added a second in the closing stages. Tie over? Not even close. The teams met a week later in Madrid. Lewandowski put Bayern ahead from the spot early in the second half, but after Ronaldo equalised, Sergio Ramos put through his own net to restore parity in the tie. With extra-time imminent, Vidal was sent off in controversial circumstances and Madrid capitalised ruthlessly, Ronaldo completing his hat-trick to put Madrid through a 6-3 aggregate winners, in the process ending Xabi Alonso's and Philipp Lahm's European careers. Yes, yes, Madrid have a certain record goalscorer of their own, but Lewandowski isn't half-bad, either. In fact, had it not been for Ronaldo, the Pole would probably be regarded as the finest out-and-out goalscorer in Europe – he's certainly the best pure striker. His record against Real Madrid, in particular, is better than most others: in seven UEFA Champions League games (W3 D1 L3) against Los Blancos, the 29-year-old has hit the net six times, four of those coming in one remarkable game for Borussia Dortmund in the 2013 semi-finals. Whereas Lewandowski missed out on last season's first leg due to a shoulder injury (and Vidal blasted the penalty that the striker would have taken over the bar), the winter arrival of Sandro Wagner has eased the burden on the Bayern talisman, who having missed out on scoring in the first leg last week, is fit and firing for the match on Tuesday. Real Madrid need no second introduction to Bayern's very own record man.